Proprietary Name: Pain Relief Pm What is the Proprietary Name? Non-Proprietary Name: Acetaminophen, Diphenhydramine Hcl What is the Non-Proprietary Name? 50844 - L.n.k. International, Inc. Pain Relief Pm with NDC 50844-539 is a a human over the counter drug product labeled by L.n.k. International, Inc.. 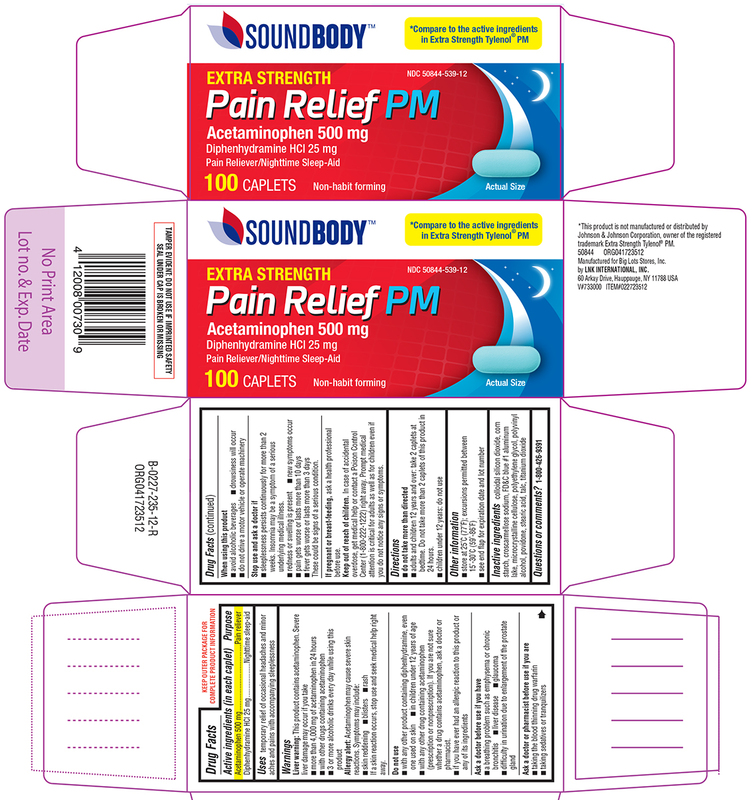 The generic name of Pain Relief Pm is acetaminophen, diphenhydramine hcl. The product's dosage form is tablet, film coated and is administered via oral form. Liver warning: This product contains acetaminophen. Severe liver damage may occur if you takemore than 4,000 mg of acetaminophen in 24 hourswith other drugs containing acetaminophen3 or more alcoholic drinks every day while using this productAllergy alert: Acetaminophen may cause severe skin reactions. Symptoms may include:skin reddening blisters rashIf a skin reaction occurs, stop use and seek medical help right away. Sleeplessness persists continuously for more than 2 weeks. Insomnia may be a symptom of a serious underlying medical illness.redness or swelling is present new symptoms occurpain gets worse or lasts more than 10 daysfever gets worse or lasts more than 3 daysThese could be signs of a serious condition.